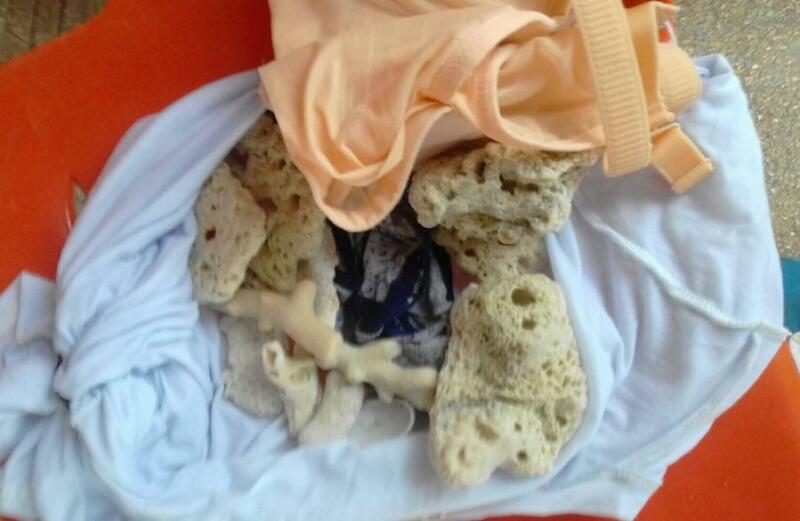 “While passengers were coming ashore from a boat on the way back from Coral Island, I noticed that two Chinese tourists were carrying pieces of cloth wrapped around something that looked like coral. So, I asked to check what it was,” said Kanchit Klingklip, president of ‘Healthy Reefs Club’, a reef conservation ‘society’ operating in Phuket. “We found pieces of coral and shells inside, which we seized. We then asked the tour guide, but he said he did not know that the two had stolen coral from the island during their trip,” he added. Mr Kanchit let all parties, including the tour guide, off the hook. He issued a warning to all three as this was their first offence of this nature. “We would like to warn everybody that it is illegal to take coral or any other marine creatures from the sea. You may be able to get past officers at the pier, but you will certainly be caught at the airport. It is a waste of time and will ruin your holiday if you have to face legal charges during your stay,” said Mr Kanchit. Other tourists in the past have not been as lucky. In February this year, a Russian tourist spent two nights in jail for feeding fish at Koh Racha before paying 100,000 baht bail to be released (story here).